Christy Warren made Filipino History Sunday, April 8, 2012. She introduced the Easter Egg Hunt tradition to her family. 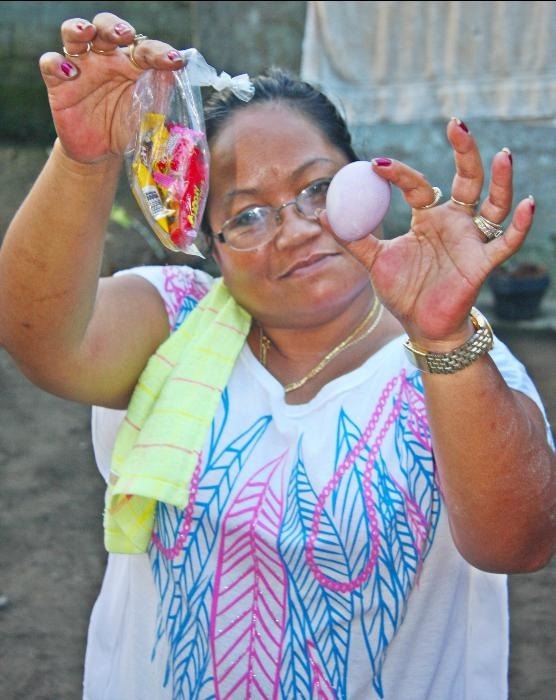 The Saldana Family of Leyte hosted the First Saldana Family Easter Egg Hunt in Barangay Baras, Tanauan, Leyte. for the First Saldana Family of Leyte Easter Egg Hunt. The nieces and nephews are out of school for summer vacation. Holy Week 2012 activities were still in full swing in The Republic of the Philippines. Christy likes passing along family traditions about the holidays. Easter Eggs are an American tradition that had no significance in the Philippines. It is a fun activity for kids. Republican President Rutherford Birchard Hayes, own children, pestered their father, the 19th president, to let them have an Easter egg hunt, which became an “Official Function” of The White House in Washington D.C., in 1878. Rayniel Saldana and Mac Mac Roa wait for the Easter Egg Hunt to begin Photo by Samuel E. Warren Jr.
Christy had seen that American kids loved their Easter baskets and hunting for Easter eggs, so chances are Filipino kids would enjoy the challenge. During Holy Week, Christy bought three dozen eggs for the kids to color. Then, Christy,Gilbert Roa, Pina Gempis, Vergie Saldana and Leneil Saldana put bite size candy bars into small bags to create Easter packets to go with the Easter eggs. Master of Ceremonies Gilbert Roa, had been directed by his aunt, Christy Warren, to hide the Easter eggs the evening before. The kids had spent Saturday painting Easter eggs, so they were anxious for the Easter egg hunt. Judylyn Gempis, Vanissa Saldana, baby, Randolph Mora, Edwin Mora, Rachel Mora, and John Paul Gempis wait for the Easter Egg Hunt to begin. 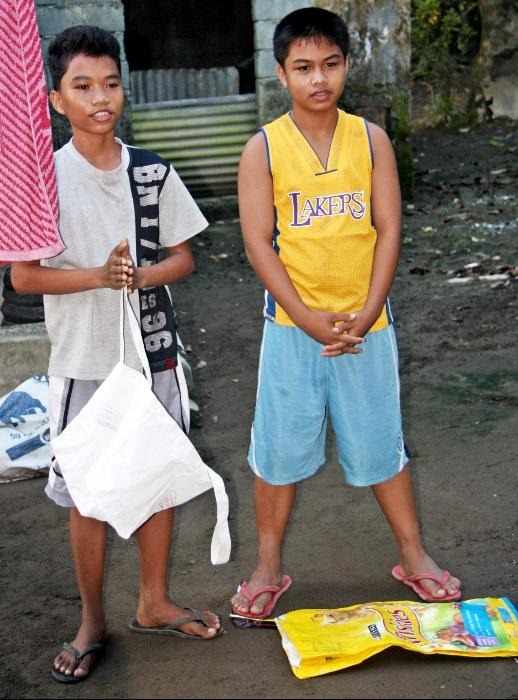 Photo by Samuel E. Warren Jr.
Chrismar Roa and Ranillo Saldana wait for the Easter Egg Hunt to begin. At Oh- Dark-Thirty, which was 3:30 a.m., members of the Saldana Family began arriving for Christy’s Easter Egg Hunt. 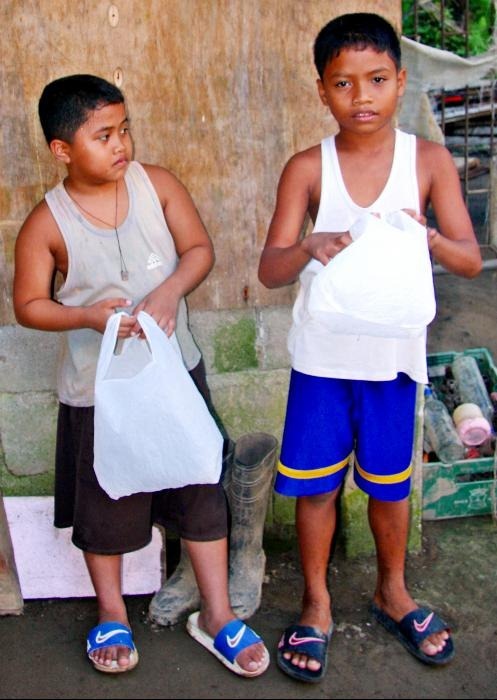 Plastic bags and an empty dog food sack filled the void of no commercial Easter baskets being available in the province. 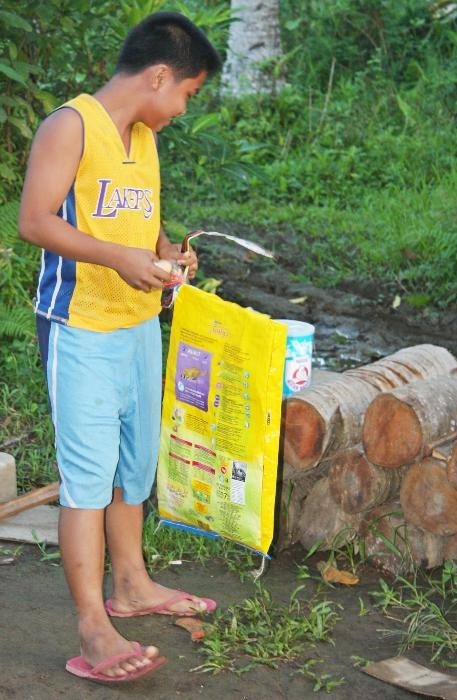 John Paul Gempis finds an Easter Egg packet tucked inside the stacks of coconut logs. 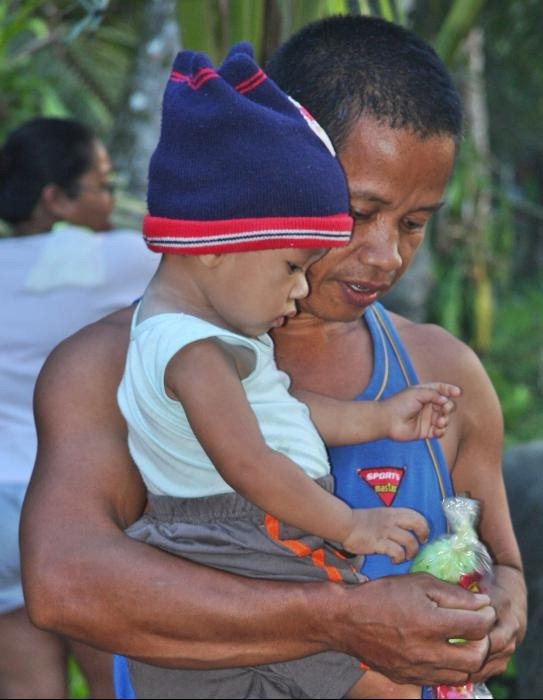 Photo by Samuel E. Warren Jr.
Rayniel and Mac Mac Roa, could well be the human incarnations of “Flash, the fastest human being alive” because they dash out to begin looking for Easter eggs. 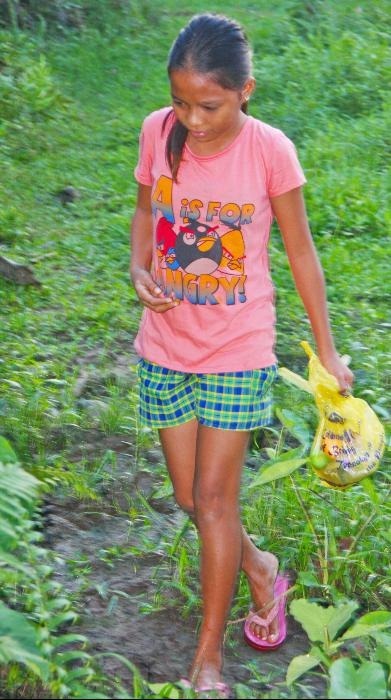 Junea Tanahale looks for hidden Easter eggs in the front yard. 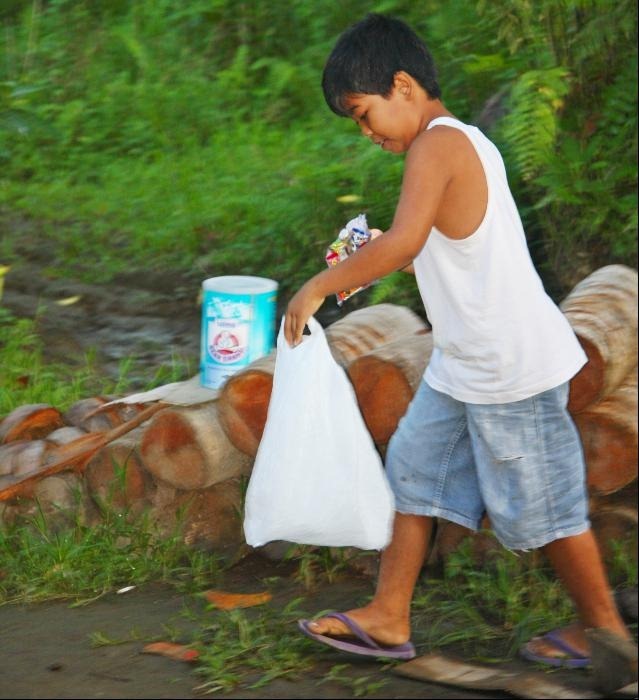 Photo by Samuel E. Warren Jr.
Ranillo Saldana looks for Easter eggs in the coconut logs. Photo by Samuel E. Warren Jr. The adults were in a mood to watch the kids at work. Mano Bito strolled through the yard and Marife Roa strolled around the yard to make sure the kids were finding the hidden Easter eggs. 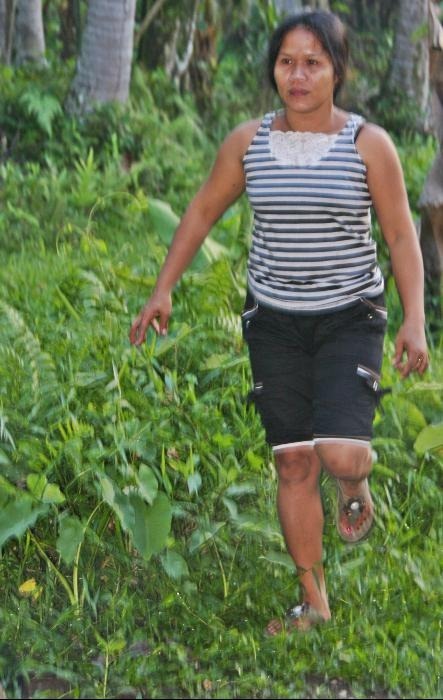 Marife Roa watches the kids hunt for Easter eggs. The Saldana, Roa, Tanahale, Mora and Gempis kids rushed around the house, into a shed and back into the house to check for Easter eggs. Randolph and Rachel Mora pose for a photo with their Easter packets. Photo by Samuel E. Warren Jr.
Randolph Mora encourages his father, Edwin, to open the Easter egg packet. With the determined diligence of NBI and FBI agents, the kids left no nook and cranny overlooked in their intense investigation of the premises. The hunt lasted 45 minutes and the kids found all their Easter eggs and the Easter egg packets. 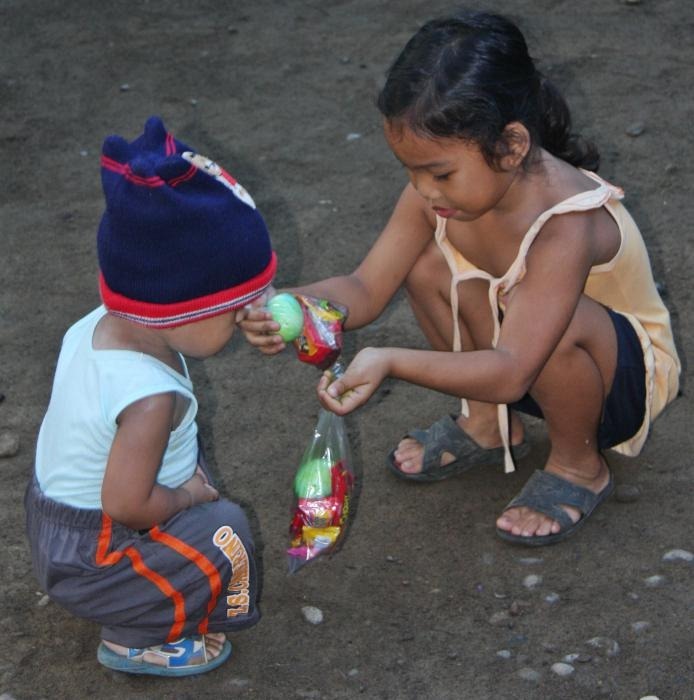 Randolph and sister, Mora, examine their Easter egg packets. 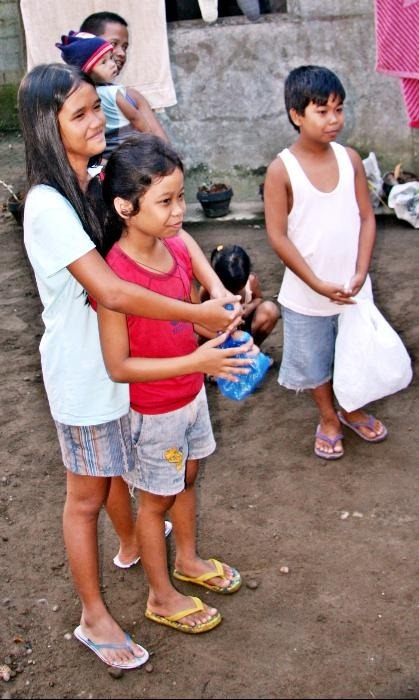 Then, of course, the kids were ready for the next Holy Week 2012 activity, which would involve a deployment to Pedro Bay. Pedro Bay, of course, is the waters of the Western Philippine Sea, South China Sea, which is the waters of the Pacific Ocean, which washes upon the West Coast of the United States. In the United States of America, across the International Date Line, The First Family of the United States of America at 1600 Pennsylvania Avenue, Northwest, would host The White House Easter Egg Roll, Monday, April 9, 2012, on the south lawn of the White House. Rayniel Saldana, Mac Mac Roa, John Paul Gempis and Adrian Dolo pose with Easter eggs. Photo by Samuel E. Warren Jr.